S derivatives as well as with all-wheel drive. But the GTS model is the one enthusiasts wait for – usually introduced later on in the life cycle. It combines the affordability of Carrera models with stellar performance of more expensive models like the Turbo. Even in this 911 Carrera GTS Cabriolet guise – complete with retractable soft-top roof – it’s the bargain model in the 911 line-up. Twin-turbo six cylinder engines are the standard – like all 991.2 models, GT3 aside – but the GTS gets more power than lesser Carreras, and a centrally mounted exhaust unique to the GTS. Like all non-track 911 models, the GTS Cabriolet features a standard 2+2 seating configuration – though the rear seats are tight and not really usable. It’s easy enough to get in and out of – more so than the Targa with its fixed rollover bar – and once inside the seating position is low slung and ideal as a driver’s car. The Sports Chrono package is standard, with drive selector switch, analog chronometer on the dash, and sport seats. Front visibility is excellent, and rear lines of sight aren’t too bad either, despite the engine and folding roof mechanism creating a hump-backed shape. In the way of practicality, the 911 GTS Cabriolet features a 4 cubic foot front trunk, necessary in addition to the standard trunk, which shrinks in Cabriolet guise to a fairly small 5 cu ft. The rear seat doubles as a storage shelf for extra space. The GTS gets all the good performance bits, such as adaptive engine mounts, active suspension with a 10mm drop in ride height, and brake-based torque vectoring. There’s also a locking rear differential and launch control as standard. Optionally, you can get rear-wheel steering and dynamic anti-roll bars for improved dynamics, more agile handling. In this Carrera GTS guise, rear wheel drive ensures a pure driving experience; with a bias towards oversteer rather than ultimate neutrality. The electronic power assisted steering is gorgeously weighted, and drips with more feedback than any other electrically assisted system. But perhaps the most incredible aspect of the firmer-riding GTS is how easily it melds car and driver into one cohesive unit. Responses are more telepathic than just merely intuitive – Porsche beating Mazda at the Jinba Ittai philosophy. The wider stance on the GTS – matched to that of AWD models – adds further stability and makes this one of the sweetest 911s around. 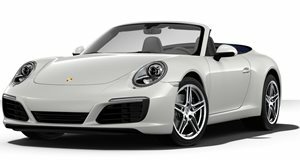 The Porsche 911 GTS Cabriolet features the very same 3.0-liter twin-turbo flat six engine as you’ll find in standard Carrera and Carrera S models. However, reworked tuning and turbochargers increase outputs – with power now sitting at 450 horsepower and torque at 405 lb-ft. Power is routed to the rear wheels in this trim, through either a 7-speed manual gearbox, or a 6-speed dual-clutch automatic. The manual is the driver’s choice, but we only wish it shifted as sweetly as the 6-speed manual in the 911 R. For those who care most for split seconds, the PDK ensures ultimate precision. The Sports Chrono package and all that it entails are standard on the 911 GTS Cabriolet, but it also features a centrally mounted exhaust system, central-locknut Turbo S alloy wheels, Alcantara interior trim and upholstery, and of course a range of options like navigation, premium sound systems, full Smartphone integration and a range of interior trim upgrades. High performance brakes and bi-xenon headlights are standard to improve safety, along with ABS brakes, airbags, electronic stability control, and available parking sensors and rear-view camera. The Porsche 911 GTS Cabriolet has not been crash tested by any local authorities. The GTS version of the Porsche 911 Cabriolet family is possibly the sweetest of the lot. It equips a Carrera S with more power and all the performance extras you can think of, at a relatively cheap price – for this segment. Others may be cheaper, some more powerful, but this is the value for money Porsche you want!